Squash may have been first cultivated in Mesoamerica some 8,000 to 10,000 years ago. 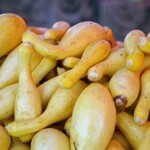 Squash was one of the “Three Sisters” planted by Native Americans. The Three Sisters were the three main indigenous plants used for agriculture: maize (corn), beans, and squash. Usually planted together so the beans can climb the cornstalk, and both shade the squash, which provided ground cover to limit weeds. The beans also provide nitrogen for all three crops. Even though most people identify squash with vegetables, from a botanical standpoint, they’re considered fruits because they contain the seeds of the plant. 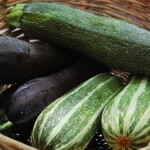 Squash are divided into two categories — summer and winter squash. 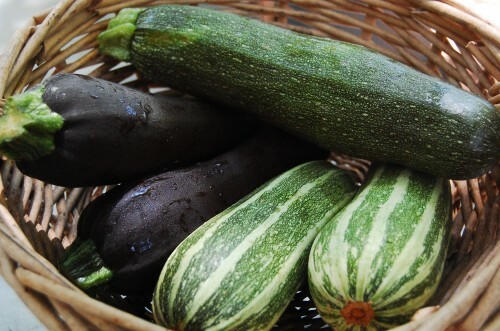 Summer squash are generally divided into four groups — crookneck, zucchini (green and yellow), straightneck, and scallop (pattypan). They have thin, edible skins and soft seeds, and are high in vitamins A and C, and niacin. The tender flesh has a high water content, sweet and mild flavor, and requires little cooking. 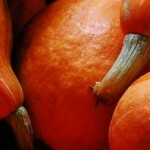 For best flavor, choose small squash (4 to 6 ounces each) with blemish-free skin. They keep well refrigerated in a plastic bag for no more than five days. 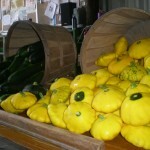 Summer squash may be left on a cool counter for a few days or in a refrigerator. Winter squash should be stored in a dark, cool ventilated space. The seeds can be scooped out or left in. 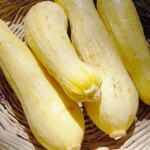 Squash should be salted 15 minutes prior to cooking to remove some of the water content, and then blotted dry. Because of their high water content, they do best when cooked with dry-heat methods such as stirfrying, grilling or sauteing to avoid the mush factor. But cooking by steaming, simmering in a sauce, baking or deep-frying are perfectly acceptable. Cut squash in half, scoop out seeds and discard. Depending on your recipe you may then bake the squash halves then scoop out the insides or just scoop out the insides raw. Discard hard shell after removing center.